The food pyramid is an essential part of the foods that our daily meals should incorporate. Many schools and colleges require students to research and write a report or project about the benefits of the food pyramid and the individual food groups. Download the Food Pyramid template that is located on this page for an easy to customize food pyramid which incorporates text and images. This download comes with thirteen pages of pop off of the page text and images that will make your project stand out from the rest. 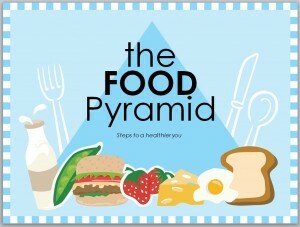 The Food Pyramid template is easy to use and is completely free to download. Get started on your food pyramid project today! First, download the Food Pyramid PowerPoint to your computer and open the template in a new Word document. Second, begin to customize the Food Pyramid PowerPoint to meet your needs. Input information and data about each food group, nutritional facts and the benefits of proper nutrition. Third, save your Food Pyramid PowerPoint to your computer, on a flash drive, on an SD card, or any other type of memory device. It may be a good idea to save your Food Pyramid PowerPoint template in two places, so that you will have a back up if you experience technical difficulties down the road. First, outline your project with details from your previous research, so you will know what you are going to work on. Second, use little known facts to grab your audience’s attention. Reviewing the same old facts time and time again can get pretty boring. If you cannot dig up any new and exciting facts, use the images to gain the attention of your audience. Third, be sure to include any necessary notes if you are preforming an oral report with your power point as a visual aid. Fourth, practice your report with friends or family members so you have your timing down and cut down on filler words. Practicing will give you more confidence in your ability to successfully get through the report. The food pyramid is a great way to show students, adults and children about how to take care of their bodies through proper nutrition. Try to put emphasis on the importance of healthy eating, and the healthy effects that nutrition can have in regards to your health.